Part of the answer lies in our nation’s pesticide policy prior to Silent Spring. Then policy-making was dominated by those favoring use of chemical pesticides including: chemical manufacturers, farmers, scientists at the USDA and in state agricultural experimental stations (Dunlap, T.R., DDT: Scientists, Citizens and Public Policy, 1981, p. 97). 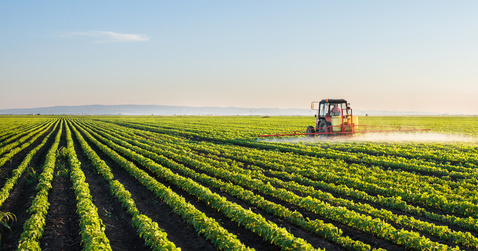 Individual scientists, even if they opposed the pesticide practices set by those powerful interests, often refrained from speaking publically on such matters for a variety of reasons. Expressing a dissenting point of view could open oneself up to retaliation from program administrators in the public or private sectors — actions that could seriously derail or adversely impact an otherwise successful career. Nevertheless, members of the scientific community in the US and abroad generated a reliable body of data on the adverse impacts of pesticides. 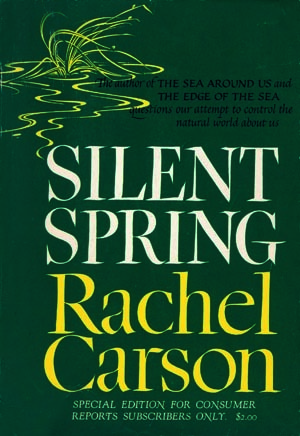 Diligently selecting and verifying scientific material for Silent Spring, Carson sought to give ordinary citizens true facts to fight with, for human health and a healthy environment. [ii] Much of the information in Silent Spring was generally previously unknown other than to those researchers whose work focused on pesticides, cancer, neurotoxicity and/or wildlife. Today in 2017, current controversies about pesticides involve the herbicide glyphosate, the insecticide chlorpyrifos, insecticides of the neonicotinoid chemical class and most recently the herbicide dicamba. 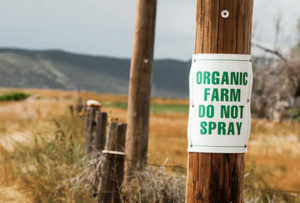 Growers of non-GMO crops (conventional and organic) are protesting that their farms and livelihoods are being adversely impacted by the chemical herbicide dicamba. (Dicamba Toxicity Facts) This volatile chemical can drift away from where it had been applied for weed control in fields planted with GMO crops (genetically modified to resist damage from dicamba). [iii] Dicamba currently has supplemented or replaced Roundup (the herbicide that had been applied continuously for the past 2 decades to these same GMO crops). Why? Because certain weeds, repeatedly exposed to Roundup over time, through natural mechanisms, have become immune to the herbicide glyphosate (active ingredient in Roundup). Farmers with non-GMO crops injured by dicamba drifting onto their fields have appealed to regulators for protection from this volatile herbicide. As a result the state of Arkansas announced a 120-day ban on dicamba this summer  and “it is considering barring its use next year  after mid-April. Missouri briefly barred its sale in July .” (Hakim, D., “Seeds, Weeds and Divided Farmers,” The New York Times, 9-22-17). The USEPA, however, has not taken action thus far in restricting dicamba’s use to mitigate farmers’ concerns about this hazardous herbicide. Farmer Wally Smith of Arkansas has been speaking out about damage to his non-GMO crops and trees that have been seriously harmed by dicamba drifting from nearby GMO fields. The damage is so serious that Smith’s farm manager wonders if he will have a job next year. (Dewey, C., “Weed killer meant to help farmers is out of control,” Wash Post, 8-30-17). Dicamba has adversely affected “more than three million acres” (Hakim, D., NYT, 9-22-17). Nearly a dozen states have complained [about dicamba] to the EPA” (Dewey, C., Wash Post, 8-30-17). Field tests by researchers at several universities found that dicamba “can volatilize and float to other fields as long as 72 hours after application.” (Dewey, C., Wash Post, 8-30-17). Dicamba is hazardous to vegetables, fruits, ornamentals, flowers and other broad leaf plants thriving in back yard gardens, cultivated as commercial crops, and just growing wild. Farmers and others are calling for better regulation of this volatile, hazardous weed killer. Today, dicamba is permitted to be used on lawns for cosmetic purposes. When applied to turf (as with applications to crops), dicamba can volatilize, drift and cause harm. 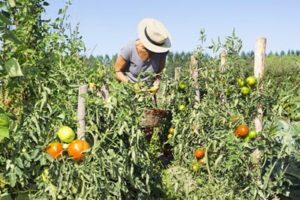 For more than a decade, home gardeners have been warned that 2,4-D a herbicide with effects similar to those of dicamba can damage tomatoes and beans due to pesticide drift from a nearby application site. 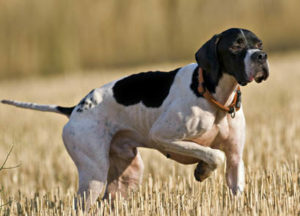 (see “Are Lawn and Garden Pesticides Hazardous: Is There Evidence? And What Can Be Done?”). Irate farmers and some scientists now are calling attention to the problems with dicamba, and several major media publications are reporting on the issue. Flower and vegetable gardeners need to speak out alongside farmers and scientists in asking for restrictions on the volatile herbicide dicamba as well as similar herbicides (like 2,4-D) and other hazardous chemical pesticides used for cosmetic purposes on lawns. Recently, high school teachers have incorporated the newly developed Johns Hopkins U. food based curriculum, “FoodSpan” into their lesson plans. 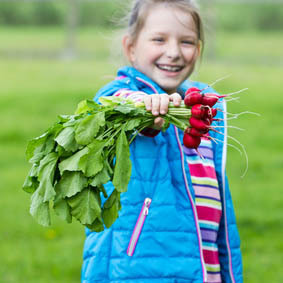 Food- Span encourages students to plant vegetable gardens on school grounds and/or at home. (Meehan, S., “Johns Hopkins’s curriculum plants nutritional lessons,” Wash Post, 10-10-17) In conjunction with cultivating tomatoes, kale and beans, students, administrators and local community leaders need to become aware of the serious toxic effects that pesticides such as dicamba, 2,4-D and others can have — even if used for cosmetic reasons on nearby neighborhood landscapes. “In developing the case against DDT Carson made what was the clearest case to that time of the central tenet of the environmental movement: that human action has become the dominant environmental influence on the rest of the planet, an influence that has spread to the farthest reaches of the world.” (Dunlap, p. 101-102). Carson’s influence helped bring environmental issues into greater prominence as she “…provided an alternative ideology, a replacement for the faith in… technology and power…” widespread at that time. “We must, she said become part of the natural world again, recognizing our ultimate dependence on the processes of nature, and working with, rather than against, them.” (Dunlap. P. 102). In the 1970s there were concerns about nuclear warfare and adverse impacts of man-made technology on the environment. Similar concerns exist today. Maurice Strong, first Secretary General of United Nations Environmental Program (UNEP), a non- scientist, and former Canadian industrialist considered that these challenges require a new kind of cooperation his words remain pertinent for us in 2017. The need to work with nature not against it is an urgent message that requires retelling today. Those of us committed to it must strive to make 2019 become another year of the environment in honor of Rachel Carson and in tribute to others sharing our concerns. The year 1969 can provide a benchmark for our efforts as we approach its 50th anniversary. Is the influence over US regulatory policies by pro-pesticide interests compatible with sustainable agriculture? Are more scientists speaking out on issues and if so who is listening? Could the adverse effects of dicamba on non-GMO crops force some farmers to grow only GMO crops (rendered resistant to dicamba) in order to stay in business even if in principle they oppose genetic engineering of crops? Could Consumers’ purchasing of non-GMO-labeled products provide sufficient financial support to growers as they struggle to maintain viable organic and conventional practices in the face of toxic trespass by dicamba and other pesticides? If dicamba is harmful to farm based plants and trees could it not also harm plants and trees in public sites that belong to everyone? Can we hope that Carson’s call for working with nature will inspire citizens to vote to elect candidates running in county and state elections who support a full range of sustainable ways of dealing with the environment including: producing food, generating energy, maintaining biodiversity, providing full gainful employment while also keeping us healthy and safe? Dicamba is a benzoic acid chlorinated synthetic chemical herbicide. It is toxic to broadleaf plants with an action similar to the phenoxy weed killers (2,4-D, etc). Dicamba was first was marketed in 1967. The basic formula (in acid and salts) is reported to have an unintentionally produced DCDD, a dioxin contaminant (Not the ultra toxic TCDD). Another contaminant of the amine salt formulations of dicamba can be the carcinogen DMA. (ChemicalWATCH, August 1987). Both contaminants have been associated with cancer (Basic Guide to Pesticides, Briggs, S., & RCC, 1992). [i] In Clear Lake as the result of 3 applications of DDD over 9 years (1948, 1954, 1957) a population of waterfowl (Western Grebe) was rendered unable to reproduce and certain individual Grebes were killed. The level of DDD in the tissue of the Grebes reached 85,000 times the concentration first applied to the lake in 1948. [ii] When citing specific information in Silent Spring, Carson was careful to identify only those researchers believed not to be at risk of retaliation for their work. [iii] For the past 2 decades certain major US crops (including soybeans and cotton), have been genetically modified (through use of biotechnology) to be resistant to the herbicide, Roundup. Genetically modified crops, are called GMOs. Higher levels of Roundup than applied to conventional crops have been used to kill weeds in the fields where GMOs are grown. But, heavy Roundup use on GMO crops has resulted in the targeted weeds developing resistance to Roundup through natural processes. Newly created GMO versions of soy and cotton crops again using biotechnology, have been made resistant to dicamba (a herbicide to which the weeds appear susceptible as of 2017).